Hidden In Old Home Deeds, A Segregationist Past Sometimes deeds read "whites only." In Seattle, Asian restrictions were common, while Hispanics were the target in Los Angeles. The discriminatory language is no longer enforceable, but the words remain a painful reminder. The clauses are so difficult to remove that in most cases only a state legislature can do it. 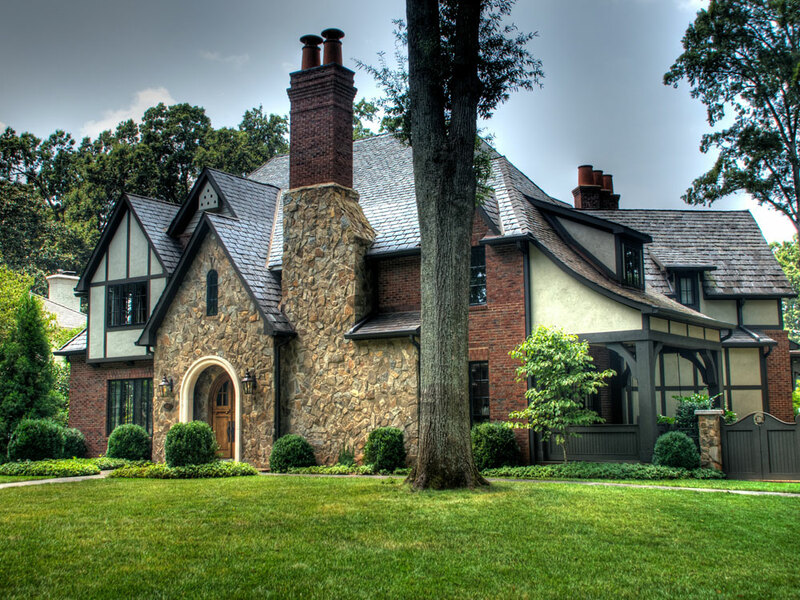 Myers Park, a historic neighborhood in Charlotte, N.C., has wide, tree-lined streets, sweeping lawns and historic mansions worth millions. It's the kind of neighborhood where people take pride in the pedigree of their homes. But Myers Park is also struggling with a racial legacy that plagues many communities across the country: discriminatory language written into original home deeds. The restrictions are no longer enforceable, but the words are a painful reminder of history. The deed on homeowner John Williford's 75-year-old Myers Park house includes restrictions written by the original developers geared to preserve the parklike feel of the neighborhood. The deeds also include racial restrictions: "This lot shall be owned and occupied by people of the Caucasian race only." Williford certainly doesn't agree with that. "I mean, things were different back in 1935, certainly than they are now," Williford says. This kind of language is in deeds across America, not just in the South. Seattle Historian James Gregory and a team of University of Washington students have amassed a database of thousands of deeds with racist wording. For the fine print of deeds in Seattle, check out a database of racial-restrictive covenants in King County, Wash.
"Racial restrictive covenants became common practice in cities across the county, dozens of cities in the North, the South, the West," Gregory says. "For, you know, a quarter of a century, this was the thing to do." Sometimes the deeds read "whites only." In Seattle, Gregory says Asian restrictions were common, while Hispanics were the target in Los Angeles. In 1948, the U.S. Supreme Court ruled that states could not enforce the racial restrictions. In 1968, Congress outlawed them altogether. But Gregory says their impact endures. "Restrictive covenants have had a long shadow," he says. Writer Mary C. Curtis is one of the few blacks living in Charlotte's Myers Park neighborhood. She bought a home here in 1994, despite the racial legacy. "There are not a lot of African-Americans in the community," Curtis says. Restrictive covenants have had a long shadow. And to her, it didn't matter. "I'm going to live where I want to and where the school was great. But that's just the way it is, and I think people should know that history — and it's not that long ago," Curtis says. The truth is most people don't know about the racial restrictive covenants in their deeds. Homebuyers rarely see the original deed and real estate attorneys hardly ever point out the race restriction. In Myers Park, it wasn't even an issue until the homeowners association posted a sample deed on its Web site that included the racial wording. William Barber, the president of the North Carolina NAACP, complained to the city. "If you saw that, it could in fact create what we call freezing — making people think twice about going. It could create psychic harm," Barber says. "It could create discouragement." The city ruled the posting of the racial deed restriction on the Web violated the Fair Housing Act. Leaders of the Myers Park Homeowners Association say they only meant to remind homeowners of the other deed restrictions — like the one that prohibits fences in the front yard. But the dispute may soon end up in court. The NAACP wants the racist clause removed from the deeds. Ken Davies, the attorney for Myers Park, says it's not that simple. "That is a completed legal recording, and we have no authority to go back and tell the register of deeds to eliminate this or that from whatever deed we don't like. And everyone knows that it's something that is a historic relic," Davies says. And it's so difficult to remove that in most cases only a state legislature can do it. A few states have tried. In California, the price tag was an issue: Imagine what it would cost to have an army of people with bottles of Wite-Out go through tens of thousands of deeds at the courthouse. Instead, most communities are content to keep the words buried in paperwork until a controversy brings them temporarily back to light.